If you’re reading this, you’re likely to be a small player in the market. For small retail players, one way to succeed in the market is to observe demand and supply. And the best way to do so is to follow the big players. Who are the big players? The banks? The hedge funds? The pension funds? Any individual, entity, or group that trades large volume is a big player. It does not matter who they are or what we call them. Hence, the best way to track big players is through volume spikes. Substantial abnormal level of volume is impossible without the big players in the game. 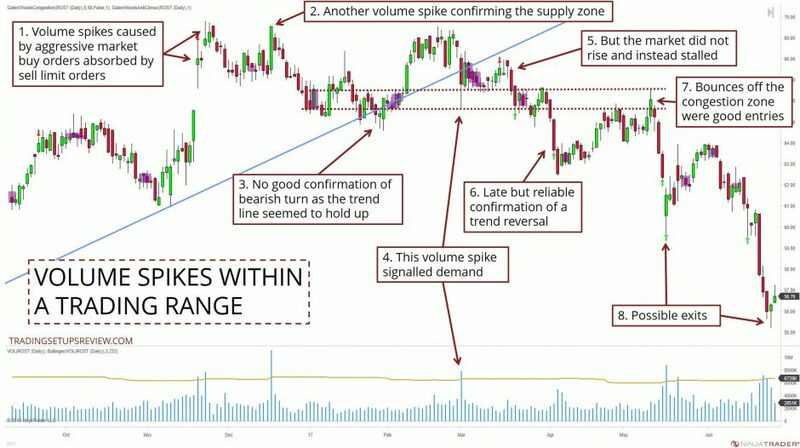 Here, you will learn how to implement this volume concept for reversal trading. Reversal trading is rewarding. Catching the start of a new trend is one of the most profitable trades. But it is also risky and has a high chance of failure. This is why you need to look to the big boys for help. I use a consistent method to identify volume spikes. Look at this article for details. Confirmation of reversal. Not all volume spikes lead to reversals. This is why you need to wait for supporting evidence to increase the odds of this trading method. You want the market to make a convincing attempt to reverse. It can be a trend line break or a powerful price thrust. Entry point. You need to decide when exactly you want to enter. You can use a price pattern or a bounce from a support or resistance (S/R) zone. Selecting a well-timed entry will help to limit your risk. Let’s study this approach with three in-depth examples. I’ll be highlighting the critical shifts in demand and supply as we go along. Consecutive price bars were pushing to new trend lows with spiking volume. Think of it as aggressive sellers bumping into a barrage of buy limit orders. These buy limit orders formed a demand zone that halted the bearish trend. Despite the promising volume pattern, it was premature to take on a reversal trade. But this upwards thrust offered an excellent confirmation of the market’s bullish intent. A reaction to the powerful bullish thrust was expected. But compare the attempt to push back down to the bullish thrust. It was clear that the bearish reaction was sluggish. The context was ripe for considering a reversal trade. The next step is timing your entry. Congestion areas often act as support and resistance. Hence, this bounce off the congestion zone was a possible entry point. If this volume surge came as the market tested a new trend high, you should be concerned. It might be a sign of supply. But instead, it took place during a pullback downwards. Hence, this volume spike bar was more likely to reflect an influx of demand from the big players. From here, the buyers took over and fuelled a bull trend. These bullish gap bars showed heavy volume. It was likely that the buyers met a wall of sell limit orders around this area – a potential supply zone. This volume spike bar was followed by a fall the lasted two weeks. It confirmed that the market met with overhanging supply. However, the market did not confirm a trend change as the bull trend line seemed to hold up. This volume spike within the trading range created the possibility of returning demand. It was possible that the market was still trapped within a trading range. (Especially with the volume spike in Point 4.) Hence, you should wait for explicit confirmation of a bearish reversal. This downside breakout of the trading range was the confirmation we needed. 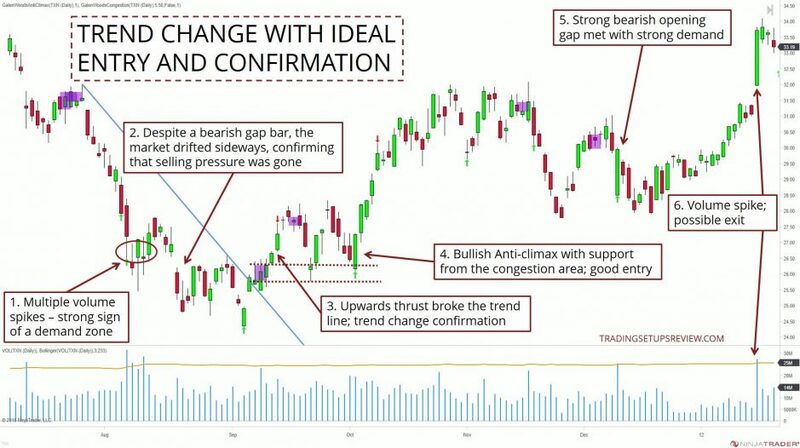 These tests of the congestion area were valid triggers for a bearish reversal setup. Volume spikes are always helpful for timing your exits to take profit. Three overlapping price bars with extremely high volume. The market might have hit a demand zone. Despite a bearish gap, the market could not push much further below the last trend low. Selling pressure had diminished. This six-bar upthrust punched above the bear trend line. It confirmed a trend reversal. This bullish Anti-Climax pattern found support at a congestion zone level. It was an excellent trigger for a bullish reversal trade. Another volume spike bar which opened with a down gap and closed high. A powerful signal that unraveled strong demand. Finding volume spikes is the easiest way to spot the big players. But it is not the only way. Sophisticated players know how to minimize their market impact. They will distribute and accumulate positions in smaller volume chunks. To spot them, look for overlapping congestion zones or use market volume profile. And even when you do spot the big players, profits are not guaranteed. They offer a fantastic first clue, but the demand and supply puzzle remains unsolved. 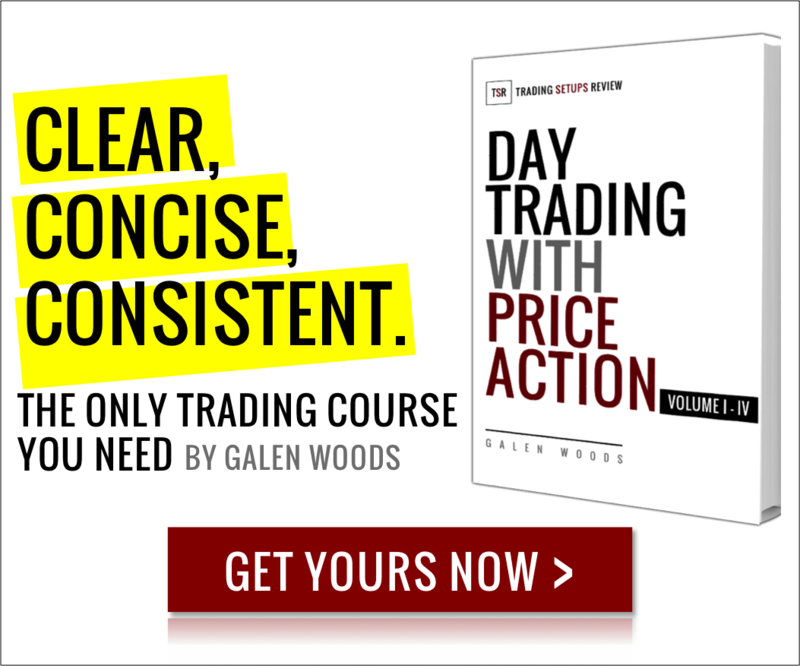 You need to analyze other market clues to determine if a reversal trade is worth the risk. This approach overlaps with the stopping volume concept in VSA. But here, we paid less attention to the specific bars and focused more on the market context. Don’t think of volume spikes as trading signals. 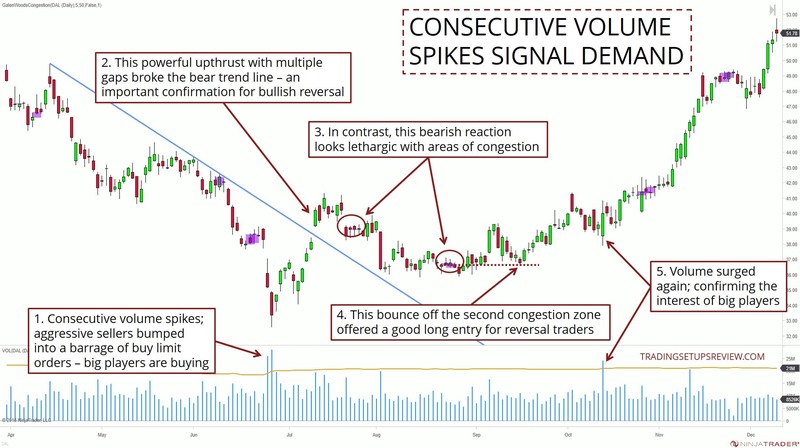 Instead, use volume spikes to focus your analysis for trading reversals.